Many Glock owners have never heard of a magwell or don’t know what it’s for. 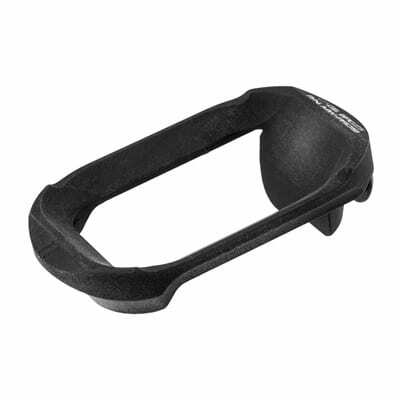 This simple construction is ideal for sport shooters or anyone looking to increase their speed, as a magwell is a great and simple way to cut down on magazine loading time. What is a Glock Magwell For? If you’re new to the concept of magwells, they’re simple to understand. Basically, it has a flared opening that acts like a funnel for the magazine, resulting in a faster load. Though they may be basic, they are highly effective if the correct magwell is purchased and a shooter understands what they’re getting into. Magwells are nice for amateurs and a huge plus for competitive shooters. Finding the right one for where you fall on this spectrum is as easy as reading our guide and choosing a great magwell from our list. Be sure to follow our installation guide as well, so your magwell functions properly. Enjoy lightning-fast magazine loads! It is possible, for example, for shooters to find that standard-size magazines ironically have to be guided in with the fingers carefully to prevent dropping. As with all gun components, it is a great addition so long as you’re conscientious of what you’re doing. ​One of the most critical differences between magwells is how much they hold your hand in guiding the magazine. Magwells designed for competitive shooters assume you’re already pretty dead on and expedite the process to shave off precision fractions of a second. Others are designed for more casual users but their larger size could be an annoyance to professionals. Extended magazines work beautifully with a magwell, as they simply slide right in with a push from your palm. Standard magazines are a little trickier and there’s a bit of a learning curve to get them right. This can also be mitigated with a smaller magwell. ​It sounds like we’re repeating ourselves, but consider this: if you have a magazine capacity of six rounds, is it better to have a magwell or simply switch to ten-round capacity magazines? There’s no right or wrong answer, as it depends on whether you like the idea of loading magazines more quickly or having larger magazines. Of course, if you’re competitive, the rules may stipulate a given magazine capacity. ​The grips and magwell are going to occupy a close space, so if you have certain types of grips (and like your grips more than the idea of a magwell), you’ll want to pay close attention to how they interact. Any grip with a tapered bottom works well, as do smaller magwells. ​For the most part, the installation of a magwell is easy. That said, some can be removed on the fly, making them ideal for those who switch scenarios often. So now you know that magazine loading can be far simpler, and you have an idea of what type of magwell to look for. Let’s take a look at each product we’ve rounded up, but don’t forget that where you fall on the spectrum from enthusiast to professional is key! Great for the Money, but Not the Best on the Market. 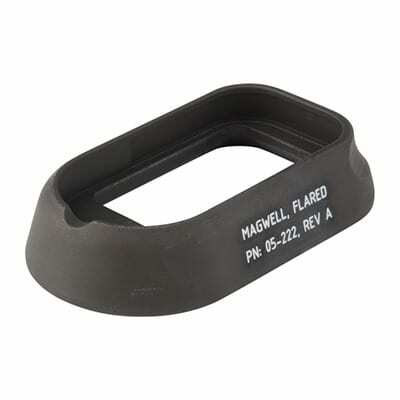 This basic magwell from Prezine fits Glock models 17, 22, 24, 31, 34, and 35, but does not fit Gen 4 models. It’s a simple design, utilizing a plastic drop-in adapter for easy installation. The mag well adds moderate flare to the bottom of your grip to increase stability as well as decreases your magazine loading time. Notably, the flare design also helps protect against jams if you drop your Glock, as it covers the magazine. 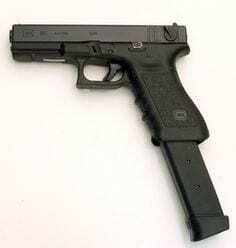 The improved grip on your Glock is indeed noticeable, which should mildly improve your steadiness and accuracy. It also does this without adding much heft, as the polymer construction is very lightweight. 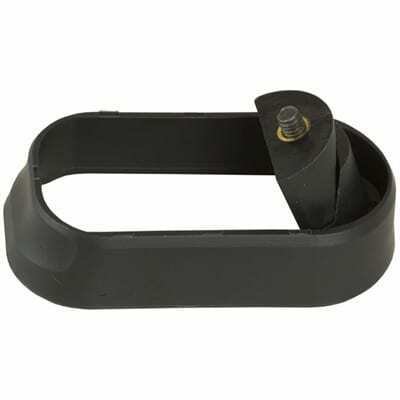 Additionally, this construction material should last a very long time, which is important as you’ll constantly be jamming magazines through it. Which brings us to the price. Considering its rugged construction and effectiveness in both loading magazines and enhancing your grip, it’s quite well priced. In fact, it’s one of the cheaper magwells on the market. That said, we strongly suggest using it as a basic upgrade to test your affinity for magwells. As an inexpensive and straightforward experiment, it works well. The only potential downside would be that those using duty guns may want to stay clear as it is a bit difficult to have to pull the magazine back out if necessary. In general, self-defense, or sporting scenarios, it’s an excellent beginner’s magwell. For those interested in trying out a magwell, the Prezine Grip Adapter & Magwell For Glock provides an excellent set of features at a great price. 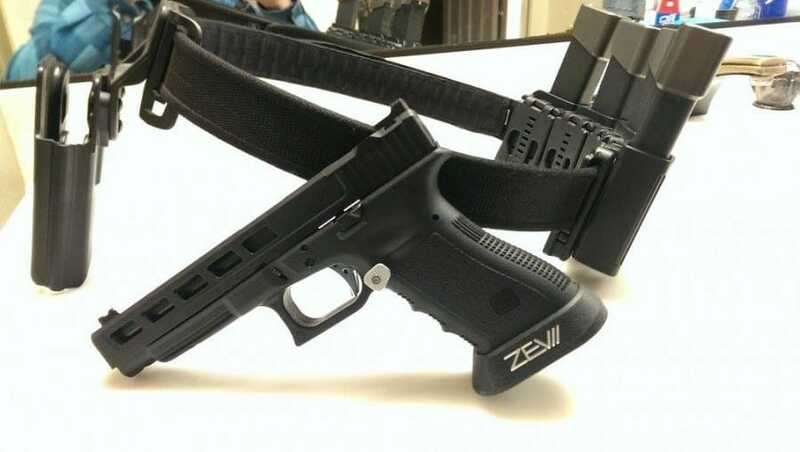 If you already have experience with magwells or just want to start off with a better quality option and are willing to spend a little more, Zev Technologies produces an excellent choice. Starting off with the construction materials, you’ll get a component made in one single-constructed piece made of aluminum and finished with a smooth, black anodization. In terms of durability, this is certainly a step up from plastic. It will last you many years and resist corrosion and other potential forms of damage. Additionally, because it is intelligently designed as one slim piece, the added weight is negligible. Its design is simple and leads to an easy installation requiring only an included screw and wrench. It is also slightly flared on its bottom, much less so than other magwells. Sometimes, less is more and when it comes to magwells many will argue that’s the case. You’ll quickly develop muscle memory over a session or two and experience faster reloading time. Additionally, it will also keep your hand in the proper position while shooting. This effect is more subtle here, but for beginning shooters who are still developing proper form, or even shooters who are simply not as familiar with a Glock, it will certainly help. It should also clear up any lingering bad habits on experienced shooters who are getting started competitively. Overall, this is an excellent piece of equipment for a variety of users. It is also available for Gen 1-4 Glock models, so you have very few reasons, aside from the slightly higher price, to try it out. Those willing to spend a little more for a high-quality magwell will get their money’s worth with this durable and intuitive offering. The Agency Arms Minimalist Magwell takes its name very seriously and delivers an incredibly unobtrusive magwell with minimal extension from the magazine well. 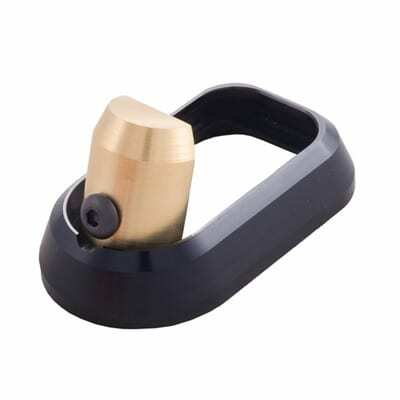 This is highly desirable for any gun owner who wants the immediate effects of feeling guidance upon inserting the magazine but does not want added weight or dimensions. You should understand that this magwell is designed for those who already have proper form and grip, as it will not intuitively enhance your abilities. It will, however, do its job very quickly, especially for those who are already fast at loading magazines. It might seem unusual for anyone already adept at loading magazines to want to shave fractions of a second off of their speed, but when it comes to competitive shooting, speed is always king. That demographic is exactly who this product is aimed at, as it helps professional shooters quickly and reliably load their magazines and push their performance to the limit. Because Agency Arms knows their demographic well, they’ve priced it accordingly. As a higher-priced magwell, it’s definitely for those who know what they want. It doesn’t offer extensive features and won’t improve your grip or other bonuses, but it does its job exceptionally well, especially when paired with a seasoned shooter. That said, it is made from aluminum as a single, slim piece and finished with black anodization. It will keep doing its singular job well for a very long time. If you’re a competitive shooter, this is probably your choice for a magwell. For those looking to maximize their speed, the Agency Arms Minimalist Magwell lives up to its name, delivering excellent results and staying out of your way. A great Balance Between Professional, Competitive Performance and Casual Shooter Assistance. The ALG Flared Magwell for Glock exists as something of a happy medium between the first entrant on our list and the Agency Arms Minimalist Magwell. It is not exceptionally small, but it also aims to be unobtrusive. Does this work? Can it enhance speed, even for less seasoned and unprofessional shooters, while still staying out of the way? In fact, it can. The question, however, is who does this work for? In reality, we believe that competitive shooters are more likely to find favor in the Agency Arms Minimalist Magwell, as it is our top choice for being nearly invisible. Everyone else will greatly appreciate a bit more volume and flare to aid them with reloads. That’s not to say it won’t assist competitive shooters, though, as it’s probably the second most-suited for that purpose on our list. The casual shooter will greatly appreciate this design, as the flare provides much more assistance than the Minimalist Magwell while still staying out of the way and ensuring compatibility with a range of grips and other accessories that may occupy that general area. It has just enough flare, however, to act as a ledge to spread recoil into the bottom of your gripping hand. It won’t assist with gripping form necessarily, but the difference in felt recoil is noticeable. Overall, we highly recommend this magwell for those who are somewhere between a casual shooter and competitive shooter—those who shoot often and can notice subtle effects in felt recoil or who care about mag reloading speed but aren’t so obsessive that shaving fractions of a second off their time is all that they care about. 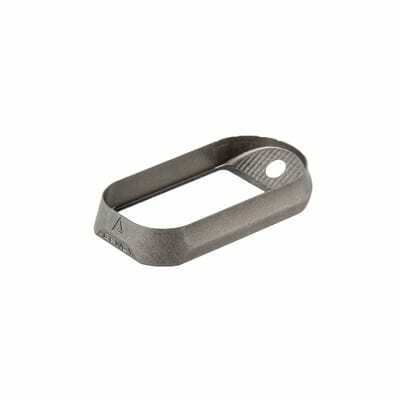 Additionally, it is a cheaper alternative to the Minimalist Magwell and is composed of aluminum with a black anodized finish. This makes it of comparable construction, truly highlighting its performance above all else—the way it should be. The main downside is compatibility. Sadly, it is only available for Gen3 Glock 17 and 22. For the vast number of shooters who exist between casual and competitive shooting, the ALG Defense Flared Magwell is an excellent choice, getting out of your way but not demanding near-perfect precision on your part. Finally, the T.H.E. Accessories Competition Magwell for Glock is another entrant to our list that is designed for the more serious shooter. Like the previous two, it is designed to be highly unobtrusive. It is much closer in design and size to the Minimalist Magwell from Agency Arms LLC. than it is the ALG Flared Magwell. Again, this is designed with competitive shooters in mind (they’ve even named it accordingly) and this is precisely who we recommend this magwell for. It will not hold your hand in guiding the magazine, so some degree of precision is already required. If you’re looking to shave seconds off your time, this is great magwell. If you need help starting out improving your speed, one of the others on our list designed for enthusiasts is a better option. Where it really diverts from the Minimalist Magwell is in its weight. It features a brass insert that installs on the bottom of the grip just behind the magazine well. Incidentally, this makes for a super-easy installation. If you know what you’re doing, it can take a minute or two, which also makes it great for those who want the ability to quickly swap it in or out on the fly—again, potentially a boon for competitive shooters who want exacting performance down to every component. Anyway, the weight of this brass insert slightly re-centers gravity toward the grip and introduces a slight reduction in felt recoil and thus, the time between shots. Amateurs will likely not notice a difference, but professionals certainly will. That said, whether this added weight is preferred by professional shooters will be a matter of taste. Many will gladly take a bit of weight in exchange for recoil control any day. We also like the price. It’s a well-designed, all-aluminum (except for the brass insert, obviously) construction with a black anodized finish for a good bit less than the other competitive offerings on our list. Whether this is the one for you will come down to whether you prefer the added weight or whether you have a Gen 4 Glock—as unfortunately, it is only compatible with Gens 1-3. Combining a magwell with a brass insert for easy installation and recoil reduction, this offering from T.H.E. Accessories offers great value on a fully-featured but still minimalist magwell. Now you know you want a magwell to provide you with that competitive edge, and you’ve picked out the one that’s just right for you. How do you install it? Fairly easily, thankfully. If it’s your first time, though, read our guide and follow along with the video to get it done in a snap. Be advised that while the process is simple, it’s very likely that you will need to be prepared to grind down parts. As always, be sure your Glock is unloaded. Each installation is a little different. Identify the anchor plug that most will have, which fits behind the grip, and is a thimble-shaped piece of metal for the products we’ve reviewed. Check the fit of the magwell. If it doesn’t fully slide into place, you may choose to grind the inside edge of the magazine well. Once you ensure a good fit, remove the magazine well and slide the anchor plug in. If you encounter resistance, you may need to grind the plug’s surface, too. Too much pressure may split your grip, so be careful. Check to ensure your magazines feed and drop properly. If not, more grinding of the plug is necessary. Now, anchor in the well with the screws provided by the manufacturer but do so loosely for now. Test it one last time, and then fully tighten the screws and use some Loctite. Glock magazines expand a bit when they’re fully loaded, so test before you have a competitive session in case you need to repeat any grinding to fine-tune the fit. That’s it! If you can make it through a session without problems, you’ve ground properly and can enjoy your new magwell!